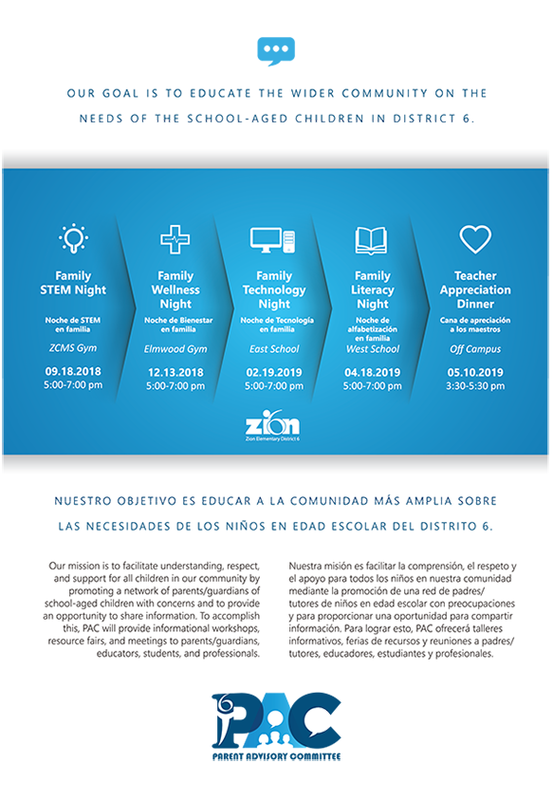 The Parent Advisory Committee (PAC) is comprised of parent volunteers who have come together to create an organized support for students, staff, and parents/families of Zion Elementary District 6. The PAC meets on a monthly basis to organize events and activities in support of the District. Select the PAC event card to view scheduled events. The Parent Advisory Committee (PAC) mission is to facilitate understanding, respect, and support for all children in our community by promoting a network of parents/guardians of school-aged children with concerns and to provide an opportunity to share information. To accomplish this, PAC will provide informational workshops, resource fairs and meetings with parents/guardians, educators, students, and professionals. To stimulate meaningful dialogue between parents, directors, and educators in Zion ESD 6. To help parents of Zion ESD 6 become more involved in their child’s education, and to help the children of Zion ESD 6 feel valued and important. To facilitate dialogue between parents and educators, to help identify at-risk or underserved children and families. To be the voice for parents of Zion ESD 6 with concerns regarding the school environment. To work with the Zion ESD 6 board and directors to help bring the wider community and the Zion ESD 6 community together for the common goal, our children. Our goal is to educate the wider community on the needs of the school-aged children in District 6.